Heat oil in a large pot over medium heat. Add garlic and onion and and cook. stirring for 15 minutes. Add tomatoes, Italian seasoning, salt and pepper, bring to a boil. Reduce heat to simmer, stirring occasionally, for 15 minutes. Set aside. Cook shells in boiling water for about 10 minutes. Don’t cook all the way. Drain and rinse with cold water. Let cool. In a medium bowl, mix ricotta, ham, garlic, spinach, parmesan cheese, salt and pepper together and set aside. Reserve half of the sauce and pour the rest into a 13×9 baking dish. Stuff each shell with a heaping tbsp. of the cheese mixture and line them up side by side in the pan. 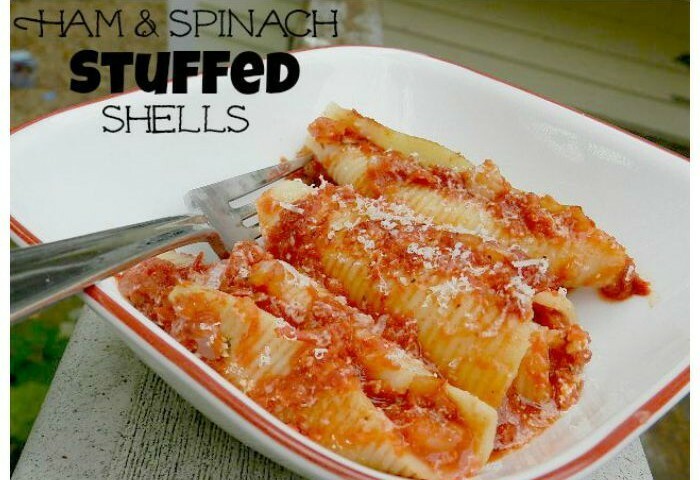 Pour the remaining sauce over the shells. Spray a piece of tinfoil with non-stick spray, cover and cook on the upper rack of the grill for 20 minutes. Serving size: 3 shells.